Kirghiz Sultan Beck and family. Kazakhstan. 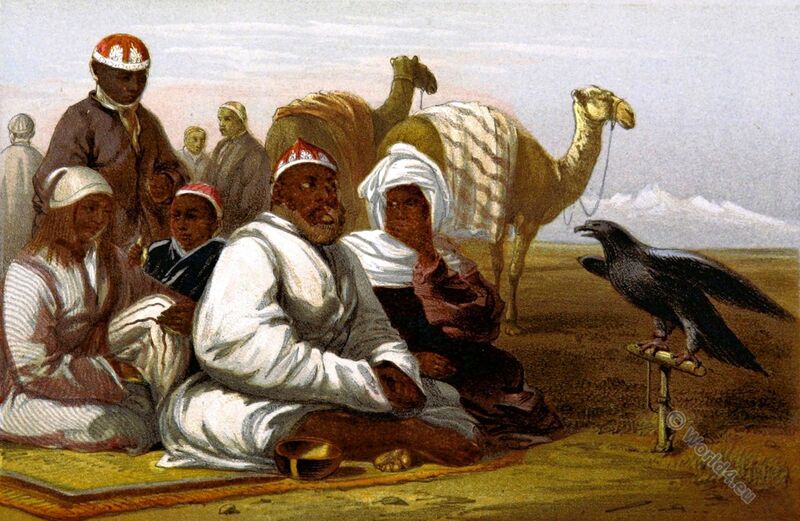 Sultan Beck and family, trained hunting-hawk and camels. This entry was posted in 1850, 19th Century, Asia, Kyrgyzstan, Traditional and tagged Traditional Kazakhstan costume on 10/27/16 by world4. 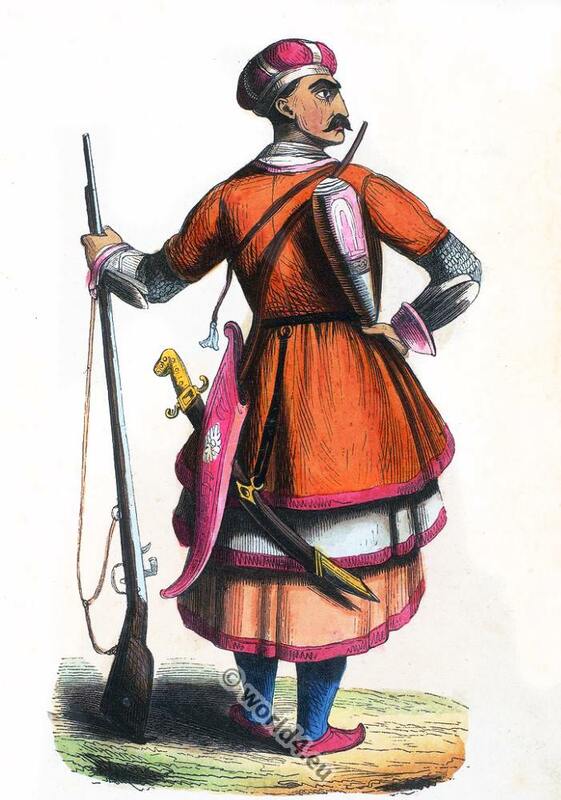 Turk Kyrgyz soldier with gun in 1840. 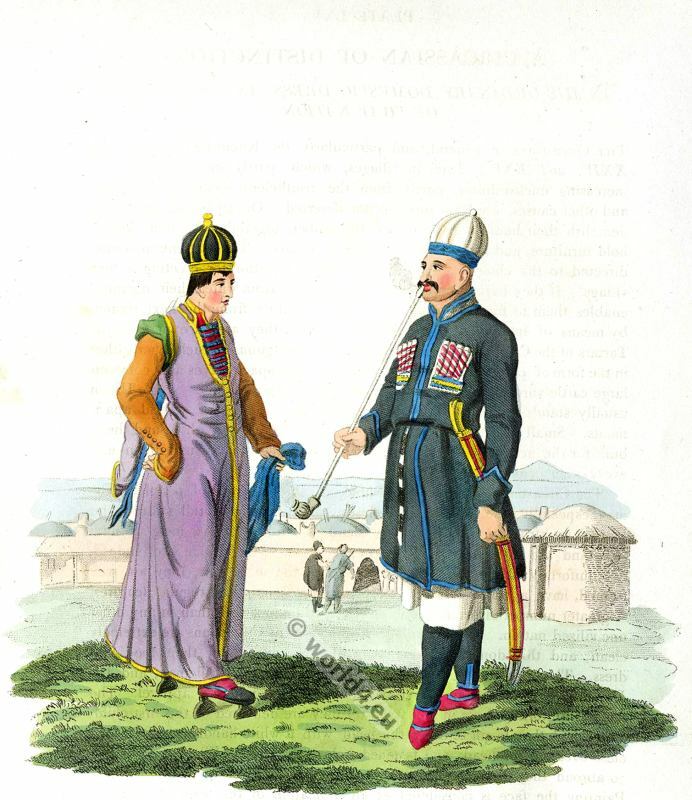 This entry was posted in 1840, 19th Century, Asia, Kyrgyzstan, Military and tagged Auguste Wahlen, Traditional Kyrgyz costumes on 3/12/15 by world4. Kyrgyz soldier costume. Prince de la grande Cabarde. Kyrgyz. Prince of the great Cabarde. Prince de la grande Cabarde. This entry was posted in 19th Century, Asia, Kyrgyzstan, Military and tagged Auguste Wahlen, Traditional Kyrgyz costumes on 2/20/15 by world4. 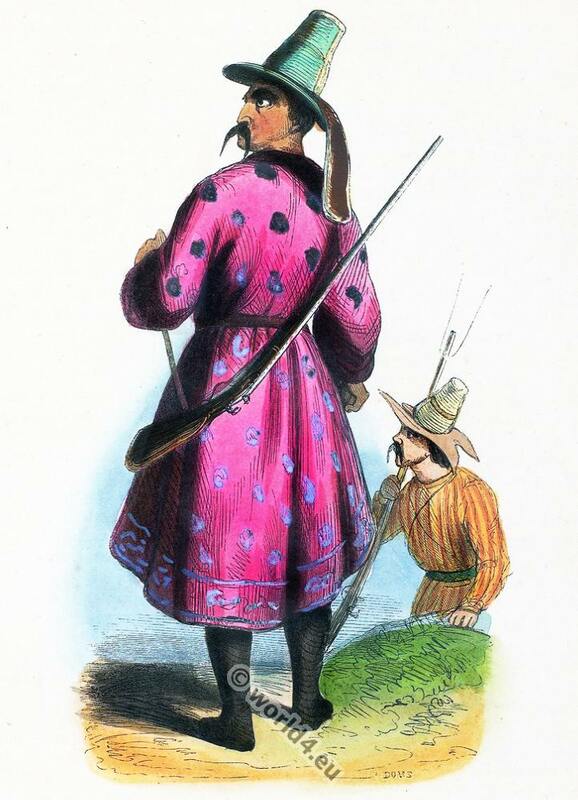 Kyrgyzstan, caucasian soldier costume, 1834. This entry was posted in 19th Century, Asia, Caucasia, Kyrgyzstan, Military and tagged Auguste Wahlen, Traditional Kyrgyz costumes on 2/19/15 by world4. 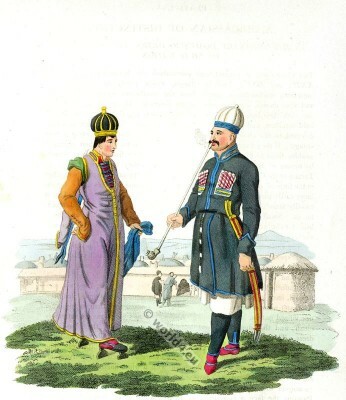 A Circassian of distinction in his ordinary Dress, and a Princess of that Nation. Un Tscherkesse distingué dans son Costume ordinaire, et la Fille d’un Prince Tscherkesse. The Cireassians in general, and particularly the Kabardians, dwell in villages, which, partly on account of the increasing uncleanliness, partly from the insufficient security they afford, and other causes, are from time to time deserted. On such occasions they demolish their habitations, carry off the timber, together with their house-hold furniture, and burn what they cannot remove. Their attention is next directed to the choice of another convenient situation for erecting a new village. If they happen to settle at some distance from water, their ingenuity enables them to form a canal, which they conduct from the next rivulet, by means of small banks; a practice in which they are as expert as the Tartars of the Crimea. Their houses are built contiguous to each other, either in the form of circles or squares, so that the inner space serves as a common large cattle-yard, provided with only one gate. The residence of the Usden usually stands detached from these circles, and consists of several apartments. Small solitary houses, or rather square rooms, arc, here and there, built for the accommodation of visitors, with a chimney, a small divan, and every other convenience. This entry was posted in 1803, 19th Century, Asia, Kyrgyzstan and tagged Edward Harding, Russian national costumes, Traditional Kyrgyz costumes on 10/31/14 by world4. 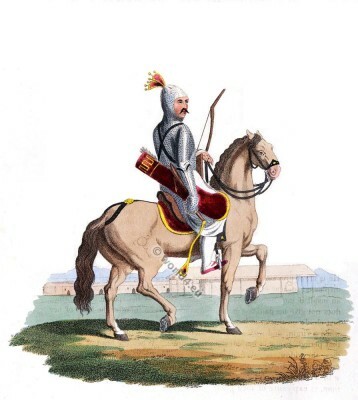 Circassian on horseback in complete armor. Circassian on horseback in complete armor 18th century. 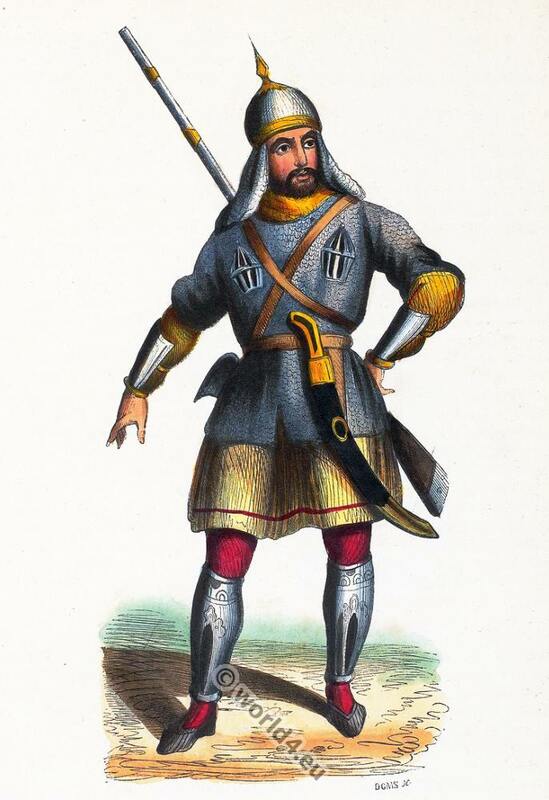 THE opposite engraving represents a Circassian on horseback, in his complete armour, a description of which has been given in the preceding Plate. The Circassian clergy and learned men let the beard grow to its utmost length; the former generally wear a deep red turban, and scarlet breeches, somewhat longer than those of the latter. Although the Circassians are ignorant, and only nominal Mahometans, yet the few priests among them are highly respected. The Princes and Knights pursue no other occupation than war, pillage, and the amusements of the chase; they live a lordly life, wander about, assemble in drinking parties, and undertake military excursions. The Usdens, or Knights, keep the lower classes of people in proper subordination, pay no duties to the Prince, but are obliged to render personal services in war. This entry was posted in 18th Century, Asia, Kyrgyzstan, Military, Russia and tagged Edward Harding, Russian Military, Traditional Kyrgyz costumes on 10/9/14 by world4. 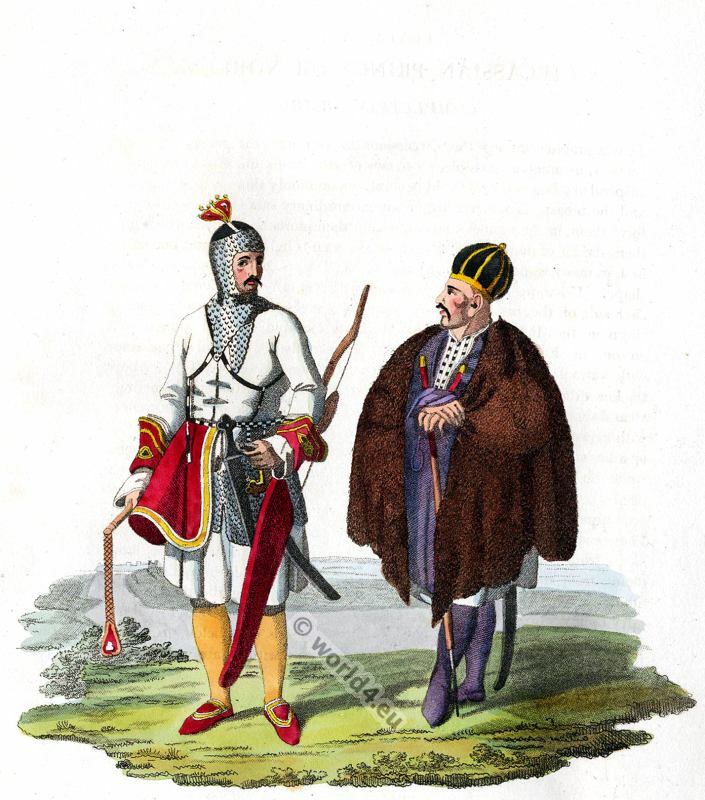 Costumes of Georgian, Circassian and Armenian Races. Georgians: 1. 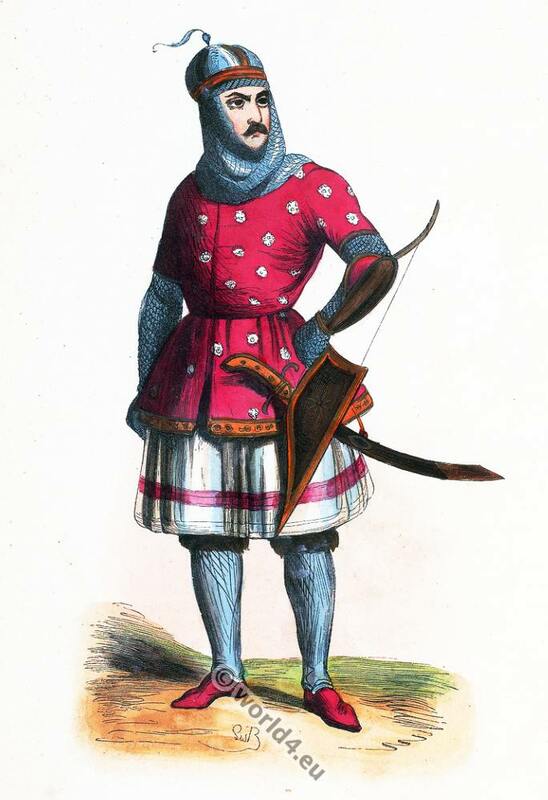 Prince in war dress. 2. Georgian lady with indoor dress. 3. Georgian Man of Kahatia. Armenians: 7.8. Armenian pilgrims to the Holy Land. 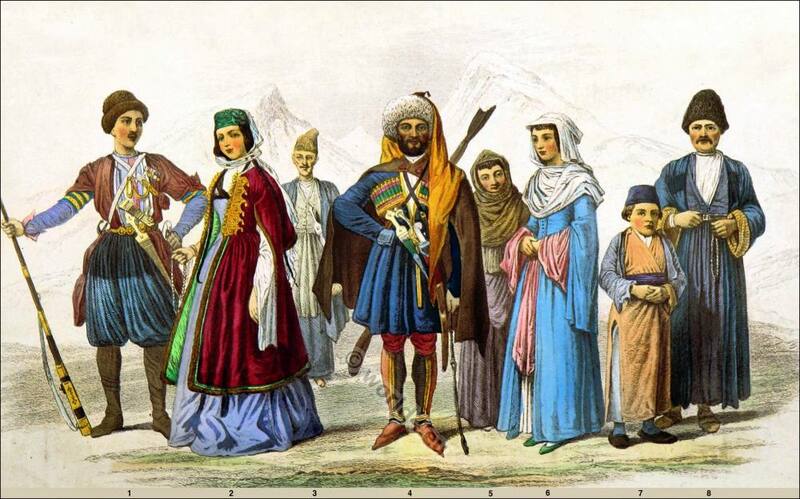 This entry was posted in 19th Century, Armenia, Asia, Ecclesiastical, Georgia, Kyrgyzstan, Traditional and tagged Races of the World, Traditional Armenia costumes, Traditional Georgia costumes, Traditional Kyrgyz costumes on 12/31/13 by world4.